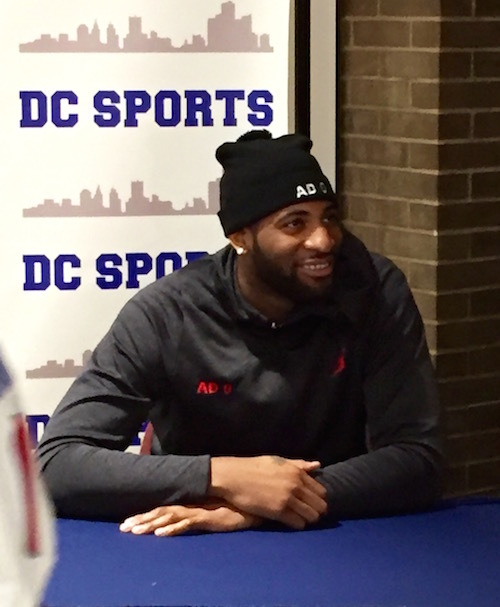 Kyle Mansour provides iFolloSports.com this photo of Pistons center Andre Drummond signing autographs at Detroit City Sports, in the Detroit suburb of Sterling Heights, Michigan. The UConn alum was the 9th pick in the 2012 draft and is coming off his best NBA season. Drummond scored 16.2 points and totaled 14.8 rebounds a game, while helping the Pistons reach the postseason for the first time since 2009, amid being chosen to his first All-Star Game. Drummond’s 14.8 boards per contest earned him the NBA rebounding title in 2015-16. For his career, the 6’11 native of Mount Vernon, New York has averaged 13.2 points and 12.6 rebounds a game. With Kevin Durant generating all the headlines as this summer’s biggest free agent prize, some have forgotten that Drummond will also be on the market, as a restricted free agent. At just 22-year-old, Drummond finds himself in line for a big payday, particularly when factoring in his size and continued growth as a player. He certainly will be one of the most coveted players among NBA GM’s. The Pistons absolutely hope to re-sign him, with the goal of building on the success of this season.